Yesterday I released StarWright 0.8.0. The main focus of this release was to greatly improve the user interface (or "user experience" to use the trendy modern term) for designing and constructing ships. This is the culmination of the U.I. work that started with 0.7.1 (the ship "info card" in the corner) and 0.7.2 (the separate repair and crew management U.I.s), which I will also talk about in this post. 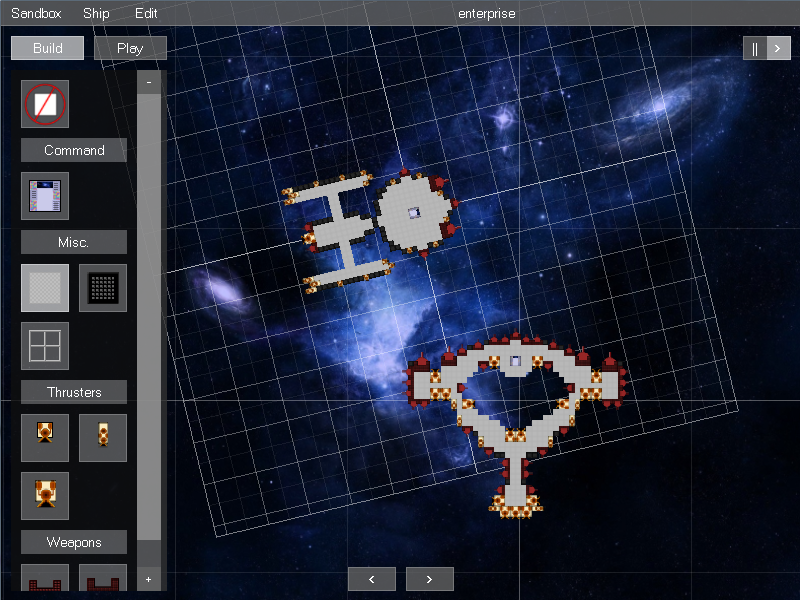 You'd hop into the "Builder" and design your ship on a grid. When you were happy with your design and wanted to test it, you'd press the "Save & Test" button, which would switch you to a testing game environment where you could spawn enemy ships to test your ship's combat prowess against. This was a really big improvement! Being able to watch a ship operate as it was designed really made learning the rules of the ship simulation much more intuitive, and players felt like they were making much more informed (and successful) ship design decisions. Now let's fast forward again by a few years (I had a job, okay?) to late 2015, as I was beginning to ramp development on StarWright back up to full speed. Up to this point, there was no real challenge or economy in the game; it was just a free-form sandbox mode where you could build whatever you want. And while creative/sandbox modes in these kinds of games are great (yes, I plan on keeping the "Creative Mode" forever and ever), my ultimate vision for the game was that the player would start with a small ship, earn money by going on missions and defeating enemy ships, and expand their own ship over time. 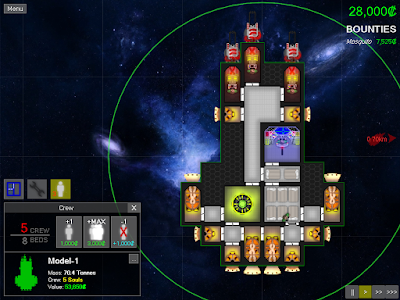 Adding parts to ships needed to cost money, but the player shouldn't be forced to waste money when they accidentally place a part in the wrong location or if they change their mind halfway through an in-progress design. 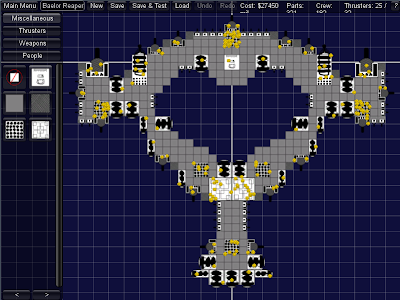 It needed to be easy and convenient for the player to restore a partially-destroyed ship back to its intended design. While a ship could take damage and have parts of it completely destroyed, its blueprints would remain unaffected. If the player wanted to repair their ship back to its intended design, they could just open up the Blueprints mode and click "MAKE IT SO" again. Fight and defeat an enemy, taking some damage and earning some bounty money. Open up the Blueprint mode and design some awesome additions for their ship. Realize they can't afford their new awesome design, and so decide to go earn another bounty. Want to repair their ship, but realize they can't without undoing all their glorious design work! And so I decided to add a "Repair" option. When this option was selected, pressing the "MAKE IT SO" button, instead of making your ship's physical condition match its blueprints, would make your ship match how it was the last time you pressed that button. And this is how it's worked for the past few months. All problems solved? I realized (again) that players were having a harder time designing their ships because they weren't getting immediate feedback from the game simulation on their design changes. Somehow, in my excitement to make Bounty Mode work, I had forgotten that immediate feedback was A Really Good Thing. The "Repair" option next to the "MAKE IT SO" button was both confusing and limiting. Confusing because it was a very important feature that was buried as an option inside the Blueprint mode user interface despite having, literally, nothing to do with blueprints. And limiting because it was an all-or-nothing choice; there was no option to selectively repair only certain parts of your ship. 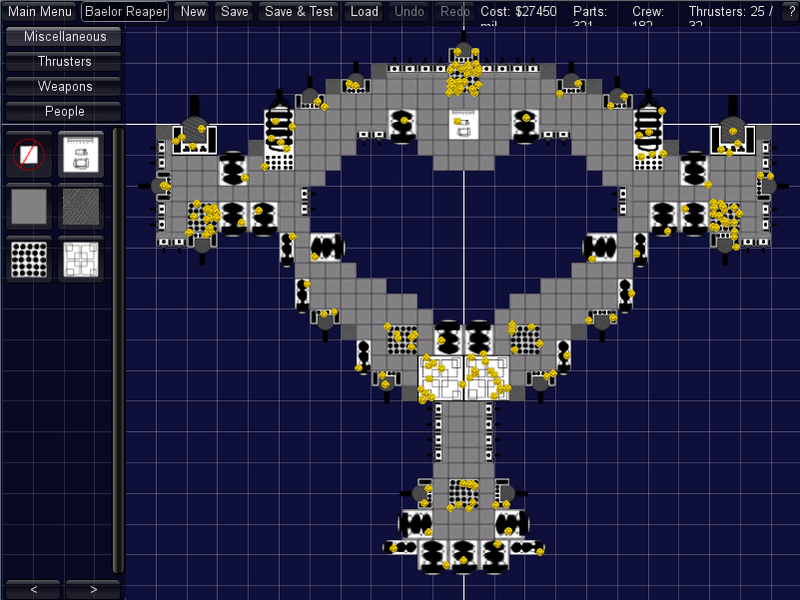 First up, I decided to dedicate a separate user interface to repairing ships; a U.I. which would be accessed by its own "Repair" button sitting co-equally right next to the "Build" button. The general idea behind the Ship Hub was that it'd be the place on the screen where the player would go to interact with their ship in any way. The dark rectangular card shows a silhouette icon of the ship, it's name, and some other basic information. (And the '...' button exposes some lesser-used options that used to be in the super-awkward alt-right-click menu.) Above the informational card would be all the buttons to access various ship features, such as the ship design U.I. and, eventually, repairs and crew. 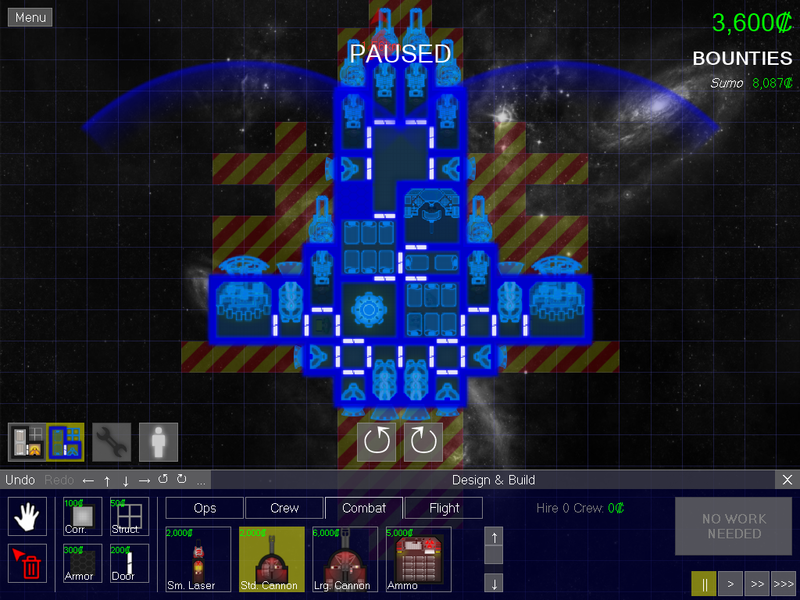 The Ship Hub was released in version 0.7.1. The "Repair Mode" is accessed by clicking the green wrench icon next to the Build button. The cool thing about Repair Mode is that it shows you exactly which parts are damaged or destroyed with a red wrench icon for damaged parts or a red overlay for missing destroyed parts. Clicking on a damaged or missing part will repair that specific part. Or you can simply click the big "REPAIR ALL" button to fix everything at once! I'm pretty happy with this new Repair Mode user interface. It's much more easily accessed and prominently displayed, and it is also much more flexible since you can, optionally, pick individual parts to be repaired. Repair Mode was released in version 0.7.2. This shows you your current number of crew relative to the number of crew your ship can carry. And it has three buttons for adjusting the number of crew: The first button adds one crew, the second button fills your ship up to its maximum crew capacity (or as many crew as you can afford to hire), and the third button fires one crew. That's it! This also wasn't strictly necessary for solving those two big problems, but it was easy to implement and is nice to have. 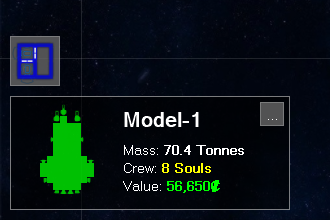 Eventually I plan on having individual crew members with different ranks and abilities, and this user interface will be fleshed out to manage them. 0.7.3 and 0.7.4 were interim bugfix released that I put out while I was working on revamping the user interface for designing ships. Blueprint mode isn't much changed from how it worked these past few months: You can freely make modifications to your ship's blueprints without regard for cost, and then when you're happy with them, you press the "MAKE IT SO" button. In fact, Blueprint mode has gotten even better, because now it will let you temporarily place blueprints in illegal locations as you plan things out, so long as you fix any problems before clicking "MAKE IT SO". Direct Edit mode on the other hand is brand new. 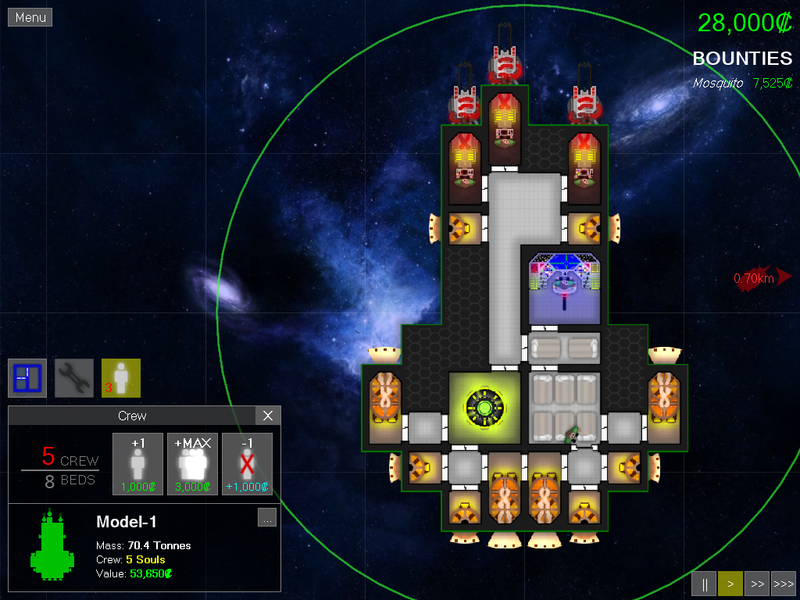 In this mode you directly add and remove parts to and from your ship, being charged or refunded as you go. (And behind-the-scenes, the blueprints will be kept up-to-date with your changes as well.) It's somewhat more restrictive than Blueprint mode in that you can't make any change that would put your ship into an illegal configuration. 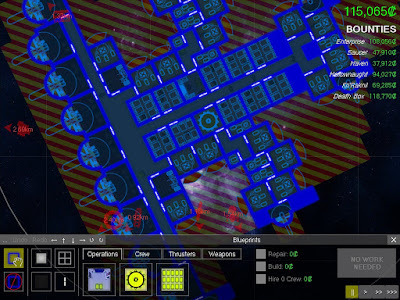 But on the flip side, you can see the immediate effects or problems of any changes you make, such as whether crew can access a room or whether a laser cannon has power. 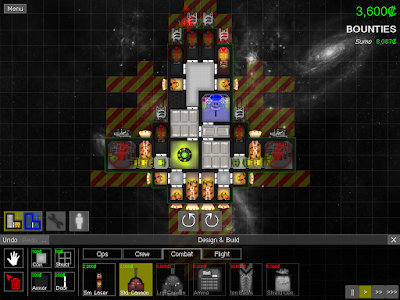 Both modes are accessed by clicking the "Build" button in the lower-left above the ship information card. The Direct Edit mode will be shown by default (although if you prefer Blueprint mode, you can make it the default in the settings), and you can then switch to Blueprint mode by clicking the blue blueprints button that expands out from the build button. There are some restrictions to when you can use Direct Edit mode that don't apply to Blueprint mode. In particular, you can't use Direct Edit mode during combat or while in debt. In addition, if your ship has any destroyed parts, those parts must be repaired before entering Direct Edit. And if you've made any modifications in blueprint mode, those modifications must be either committed or discarded before returning to Direct Edit mode. (If you open the ship designer and Direct Edit mode is unavailable for any reason, Blueprint mode will be shown instead.) These restrictions are necessary to make sure that you can't make any changes in Direct Edit mode that would break either the Blueprint or Repair modes. While in either Direct Edit or Blueprint modes, the background is dimmed and a build grid is displayed underneath your ship. This should make it easier to eyeball distances and also make it more obvious when you're in design mode instead of being able to control your ship. The cost (or refund) of making any changes to your ship is shown underneath the mouse cursor. The logic that determines where to automatically add doors between parts has been greatly improved, especially when the "Overwrite Existing Parts" option is turned on (as it is now by default). It will no longer remove any doors that didn't actually need to be removed, and it's much smarter and more aggressive about adding doors as new parts are placed. This is the kind of improvement that, if it works well, you won't notice it at all! 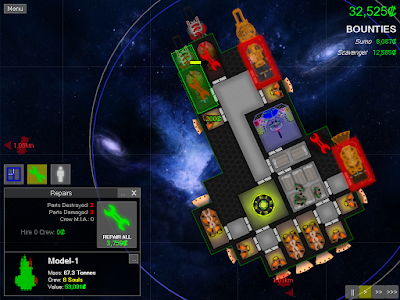 Adding a Crew's Quarters or Crew's Bunk in Direct Edit mode will, by default, automatically hire crew to go along with it. And lots of other little improvements that you can read about in the version history. As always, thanks for playing! And please post whatever feedback you have!